Tourism and its understandings have most certainly been a delicate matter of debate in countries such as Spain, which has been ranking among the top destinations for several years already. Not only does tourism shape the economy of the place but it also affects the way locals live and the way the same place evolves. It is a complex phenomenon that varies according to many external factors and cannot be understood in one simple way. The island of Ibiza has been well known in the tourism industry as early as the late 1950s, when new infrastructures allowed the masses to reach the island in an affordable way. Since then, Ibiza has been shaped by this flux of tourists, whose expectations influenced the way the perimeteral area of the island developed while an untouched interior landscape was maintained. If on one side the perimeter of the island, reshaped in numerous ways, has been absorbing the majority of the economical impact of tourism, on the other side the rural interior landscapes faced a strong crisis, consequence of the lack of profitability of the primary sector. Today, in a scenario in which the rural interior lacks investment and inhabitants, and the developed perimeter gives clear signs of the decadence of an obsolete model based on the masses and cheap party tourism, the need of a new touristic model becomes manifest. Such new model should not fall in the reiteration of the old “sun and beach” but rather in a development of a sustainable tourism of year-round basis, with low ecological impact and high social revenue for the island. 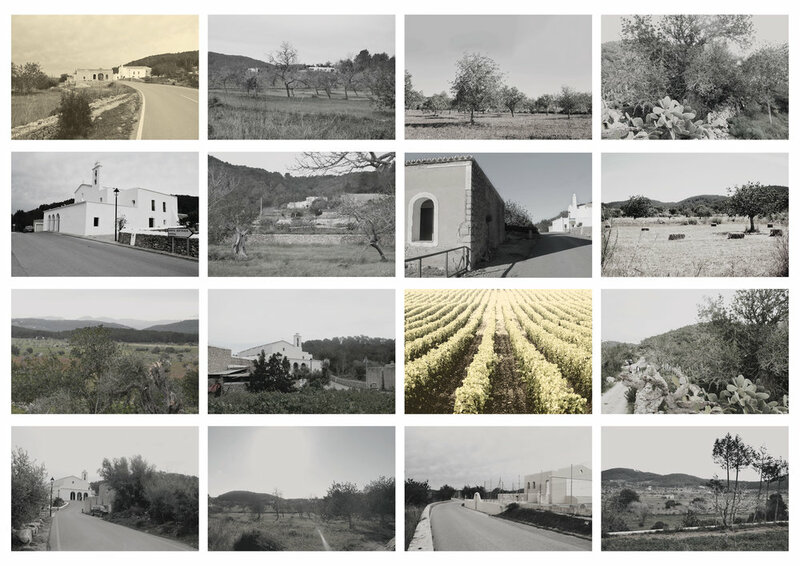 It is in this context that Linear Landscapes tackles the problematic of locality in a global over exploited island, understanding tourism as an opportunity for the responsible growth of an underdeveloped area of Ibiza. 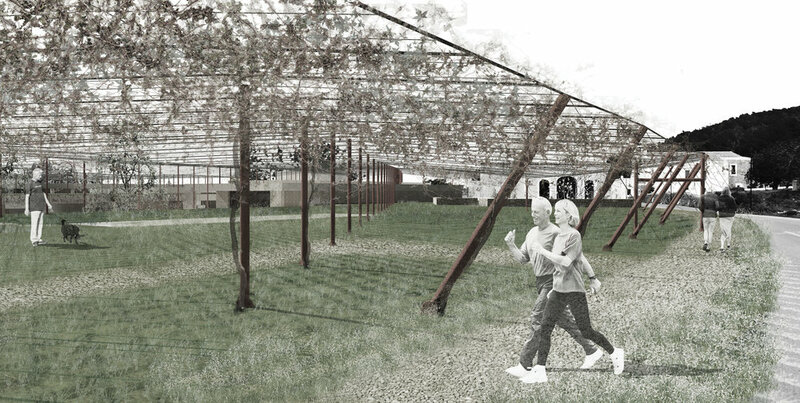 Located in a rural area in the North of the island, Linear Landscapes speculates on a new type of tourism that seeks to repopulate the interior abandoned landscapes by attracting senior citizens from around the world. During the last decades, senior tourism has indeed proven to be a real opportunity of investment and sustainable growth for rural areas. Both because of the world population ageing but also because of the better health conditions of elders, senior tourism is an expanding market that can benefit the island by providing a strong year-round type of tourism whilst rethinking the traditional models of Tourism in locations of drastic contrasts such as Ibiza. 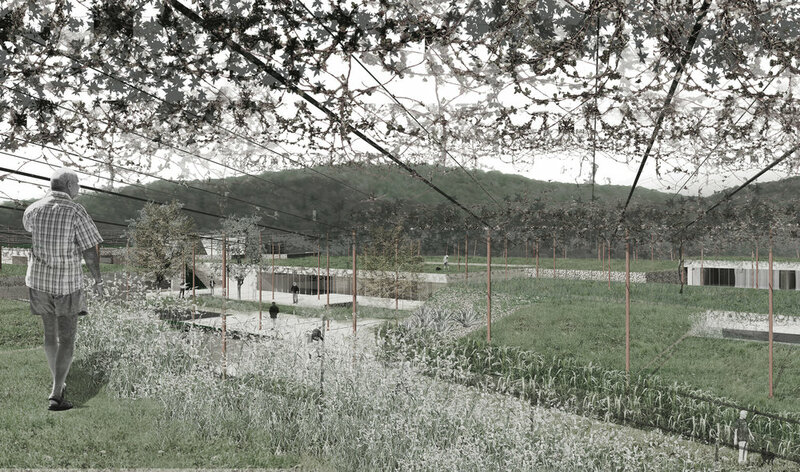 This new tourism model proposed by Linear Landscapes responds to the need of an active population looking for a quiet and relaxed environment combined with a strong contact with nature. Given the high impact that such touristic infrastructure could have on the site, the project is understood as a landscape intervention. 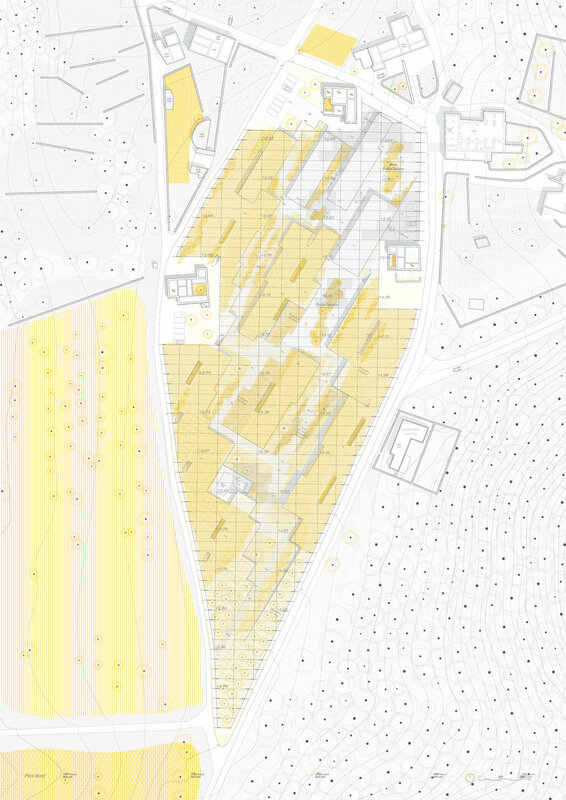 Located in a partially abandoned area in the centre of Sant Mateu, a series of indoor spaces are created by the accentuation of the existing valley-like topography. These spaces are developed as part of the soil, while public and green spaces consist on those areas that are carved out from the valley. 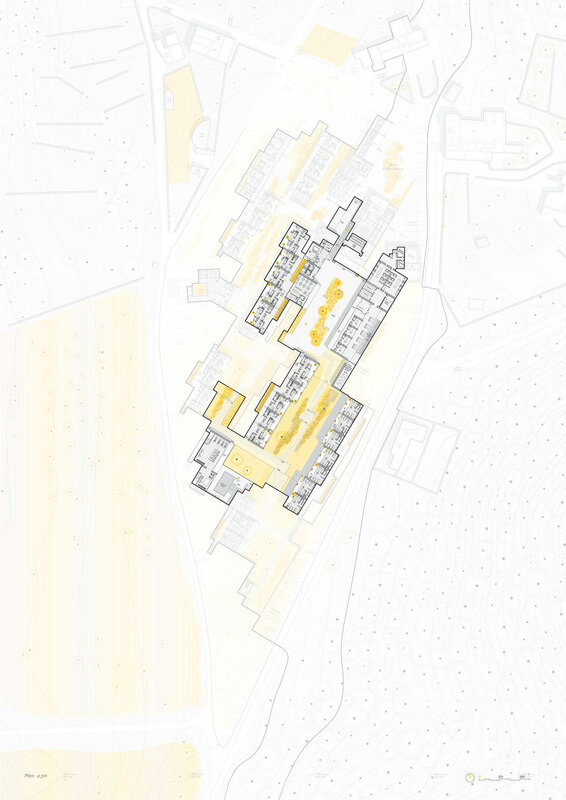 The intervention is strongly rooted to the site and becomes part of the productive landscape since the program is covered and unified under a thin programmatic veil. This canopy recalls the agricultural infrastructure of greenhouses and vine trellis and it references the activity of wine production, which is what the village is primarily renowned for. 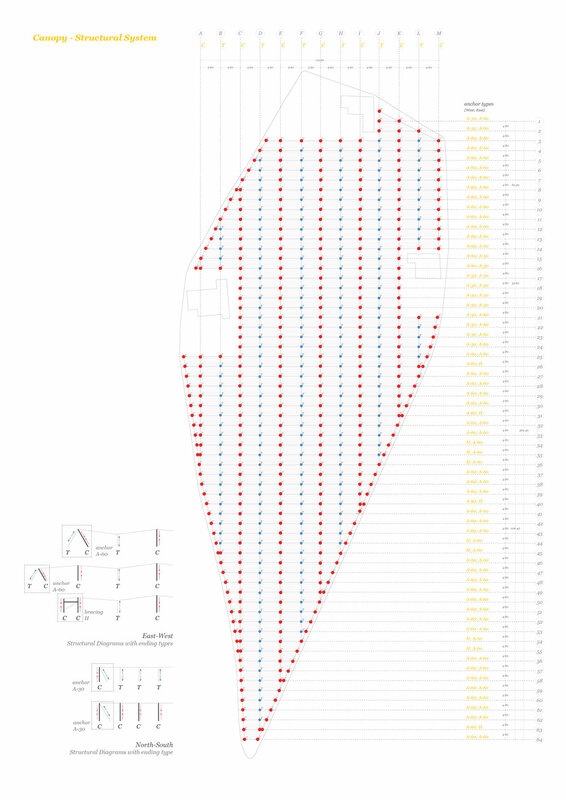 Both canopy and the carved spaces are developed in a linear way that follows the agricultural language. Programmatically, three different areas are created to suit best the needs of the future users: accommodation, medical centre and leisure. 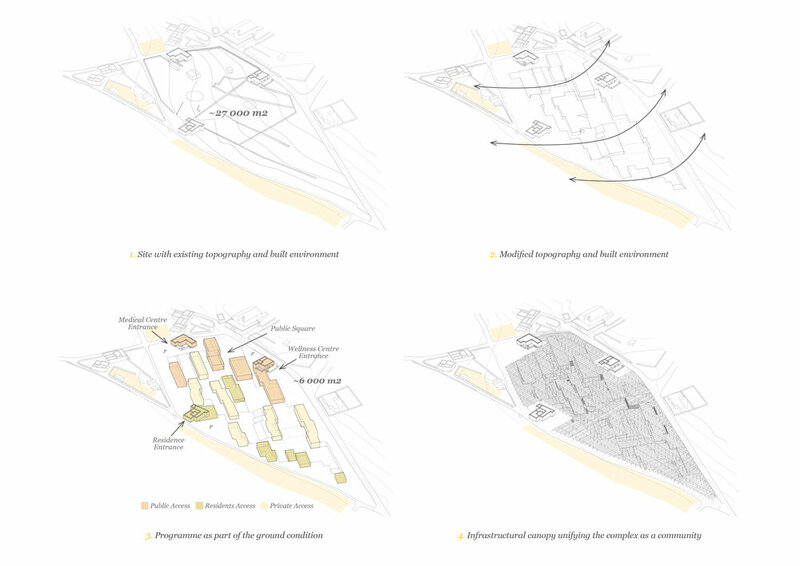 These three main parts of the program refer back to the three existing buildings which are left uncovered by the canopy, marking their past relationship with the field and their presence as entrances. In a context of an financial and social crisis it becomes key to rethink those economic models that helped Spain reach an economic welfare in the previous decades but that today give clear signs of fatigue. The current unstable financial scenario should be seen as an opportunity to act and improve outdated models in order to plan a sustainable growth of those industries that have such strong impact in the environment. New strategies for sustainable tourism development are also an opportunity for architects and architecture to speak up, to gain relevance and foster contextual approaches, defeating the “white canvas” position that the discipline had in previous decades. 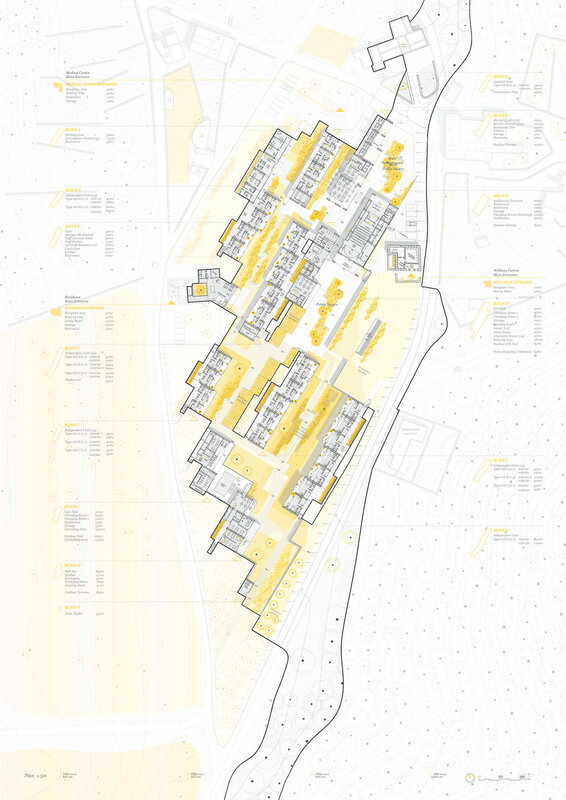 Linear Landscapes proposes a new model of tourism in which, through a proactive architectural approach, the success of the strategy does not only lay on the place or the amenities but rather in the developed atmospheres and relations to the context. Architecture here is not tangential to the success, but it is full part of the success, something necessary in order for the discipline to stay relevant in the upcoming decades.